5th Friday Surprise: Blog tour of the Italian south! Like the light at the end of this street in Salerno, the Italian south draws me to explore. Join me today on a tour that will leave your hungry for more. I’m sharing some of the other blogs about southern Italy that have inspired me. Michelle Fabio’s www.bleedingespresso.com is a favorite–she moved from Pennsylvania to her family’s ancestral village in Calabria, and stayed! At www.napoliunplugged.com, Bonnie shares all things Naples, from transportation strikes to church services, in the city she describes as “beautiful, chaotic, unbending, romantic, confusing”. Get to know this vibrant, gritty city better! If Sicily tugs at your heart, visit http://lostinsicilia.blogspot.com/ for a smorgasbord of Sicilian topics, like kid-friendly sightseeing, festivals and holidays, natural wonders, and lots more. Mary at www.flavorsofabruzzo.com shares a lot about food, as the blog name suggests, but there are plenty of other topics sprinkling flavor throughout her posts. 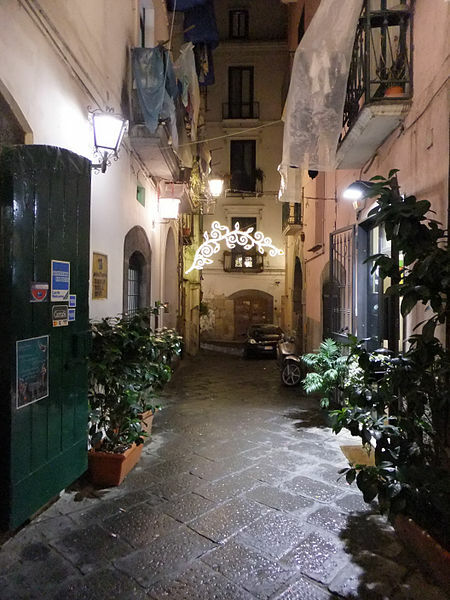 This entry was posted in Blogs and tagged Abruzzo, Calabria, food, Naples, sicily, travel. Bookmark the permalink.